Audi have released their new A3 and S3 ranges, which have both received new S tronic transmissions. The new facelifts include new fenders, a new front bootlit. The front bumper and single frame radiator grille have also been modified. The car also has the option of additional bi-xenon headlamps with LEDs. The A3 boasts about its new exterior mirrors with integrated indicators, new door handles and new bumper and lights at the back. The interior has been changed as well, the controls below the audio system have been changed, and for the customers who want performance there is also the optional flat-bottomed leather steering wheel. The A3 and S3 have the new feature which allows the driver to change its magnetic ride. You will now be able to switch between sport mode and normal mode by just flipping a switch. The magnetic ride is influenced by magneto-rheological fluid circulating in the shock absorbers, when a voltage is sent to the suspension the properties change causing the ride to either be comfortable or crispy firm. A new feature in the 2009 range also includes the S tronic transmissions. 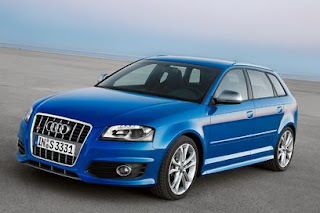 The engines in the A3 and S3 range from the 2.0-TFSI, 3.2L V6 and other diesel versions. The seven speed transmissions will be available with the 1.6, 1.4 and 1.8-TFSI engines. The engines are the same as the old range, but with the S3 Sportback now pushing out 195kW from the 2-litre turbocharged motor. Both the price and auto insurance quotes are not yet released. Auto-Insurance: No auto insurance quote has been given yet.